The best aspects of this course included being guided through the process, being provided with the many options for delivering a flipped unit and exploring the technologies. I appreciated the warnings of what to avoid and pitfalls to be aware of. I have been immensely encouraged by the positive feedback of the students who trialled the lessons. Have you been frustrated by lost lessons and student absences? Been dabbling with blended learning units but it's all a bit too difficult and messy? Wish there was a better way to have students interact online and utilise social learning principles? A 'yes' to any of these questions, means this course is for you. Create an extra "you" in the classroom. This 16-week online course caters for high school mathematics teachers who want to create, then implement a flipped or blended unit of work. (Refer to the course prerequisites below). Flipped learning/blended learning allows students to access ‘teaching segments’ in their own time thereby freeing up class time for collaboration and exploration. However, this is not necessarily about students ‘watching lectures at home’. Rather, the Flipped-mastery model is encouraged where teachers create comprehensive, student-centred, online units of work for students to access both during and after lessons. As the title suggests, participants will create a flipped/blended unit of work trial the unit with students and report on their implementation experience. Sourcing videos, creating instructional (screencast) videos and delivering content online. The course recommends various software but will cater for a range of technologies. Examples of how to create formative assessment and feedback opportunities using blended, online units are provided. The course caters for computer-based technologies as well as iPads, and Tablet-PCs. Participants need to be competent with technology i.e. be able to manage multiple programs and windows simultaneously, readily adapt, learn and troubleshoot new software. Participants do not need to be advanced users of technology, rather, competent users. 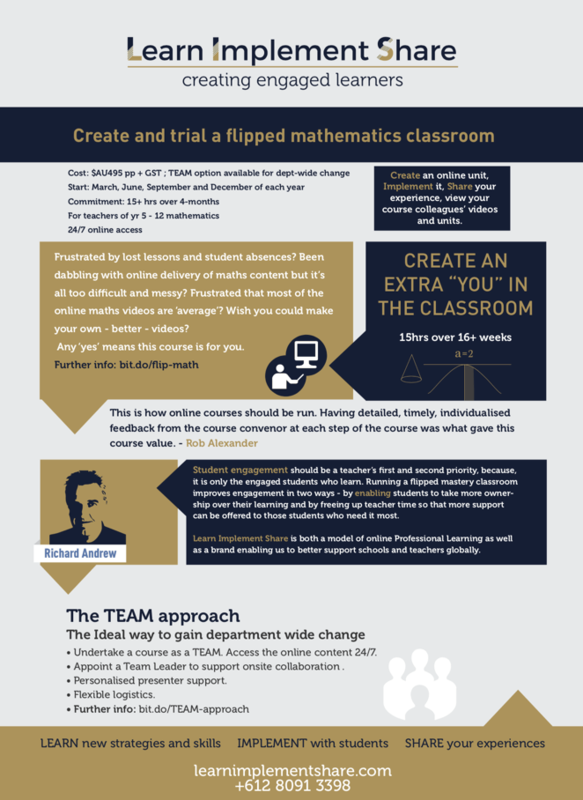 The flipped mathematics classroom explained. Some advantages, issues and obstacles to be aware of. Examples of flipped units are provided. Arguably, the most important aspect of the flipped classroom is the fact that it promotes student-centred learning. This module looks at the issues around student-centred learning and the management of student-centred learning in the context of the mathematics classroom. After exploring different types of mathematics videos, participants are coordinated to search, find and share several, quality instructional videos resulting in each participant gaining multiple, quality videos across multiple topics. Do I need to be confident with technology to cope with this online workshop? Regarding the online nature of the course - no. The free online platform (Open Learning) used in this course is very user-friendly. However, given that you will be following tutorials on how to create videos and assemble online content into flipped/blended units you will need to be reasonably confident when learning to use new software/apps and be able to multi-task with your device. If you want to use a different online platform, there will be tutorials provided for several platforms. Why would I need to do this course - there’s so much free information online about how to create flipped/blended learning units? It is true there is an enormous amount of freely available information about creating flipped/blended units, and you can certainly learn how to create videos and blended units from searching the web. However, the difficulty of working it out on your own is that ‘You don’t know what you don’t know’. On the web, you won’t find someone with 3000+ hours of experience creating videos, online content and online/blended units who is prepared to guide you through this multi-faceted process step by step. Furthermore, the information on the web tends to be ‘one-dimensional’, lacking context. For example, many free tutorials sing the praises of various platforms in which to create online units but rarely does the information reference the big issues: User-friendliness and the ability of the platform to create student-centred units based on social learning and collaboration. What are some of the big questions that the course addresses? What are examples of the various types of mathematics-instruction videos? “What are the pitfalls of using online platforms that are based on Facebook-like feeds? 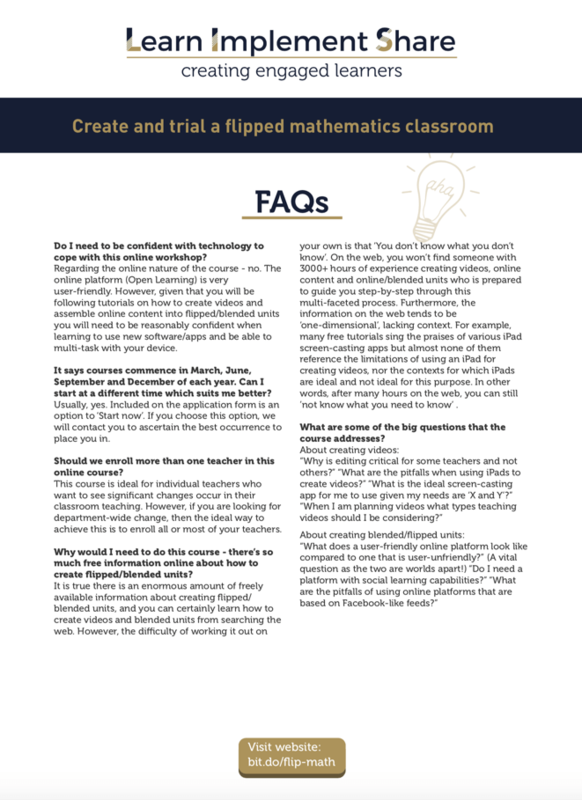 A requirement of the course is to create a flipped mathematics unit, implement the unit with students and submit a report on the implementation experience. Below is an example implementation report. At first, my Top Year 10 class were very concerned about completing a unit online. However, once they found that I had created all of the videos they quickly came round to the idea. The students coped very well to the change in lesson structure and quickly got used to watching the videos at home and working through content in the classroom. The students all worked through the unit at very different paces, I tracked student progress by asking them to comment on each subtopic/page once complete. I also helped students by giving them deadlines for each subtopic to ensure they were keeping up with the content. The higher ability students loved the freedom of being able to go ahead and continue with the topic at their own place at the same time the less able students were appreciative of being able to watch the videos multiple times. Overall, the flipped classroom experience was relatively easy to get used to for both me and the students. I had much more class time to individually assist students. I really enjoyed delivering the unit in this way, it did take time to develop but I now have the videos to reuse/improve for next year. I will definitely keep on flipping. ​Completing Create and trial a flipped mathematics unit (online 7-12) will contribute 15 hours of NESA Registered PD addressing 6.2.2 and 6.3.2 from the Australian Professional Standards for Teachers towards maintaining Proficient Teacher Accreditation in NSW.